The Great Debate: Is The 51 Percent Rule Good For Minnesota Wineries And Cideries? In Minnesota, cideries and wineries with a farm winery license are required by state law to use enough Minnesota-grown fruit to constitute at least 51 percent of their product. The same goes for cideries and wineries with a wine manufacturer license if they want to sell their product on-site, say, at a taproom. Our question: Is this law good for Minnesota cideries and wineries? 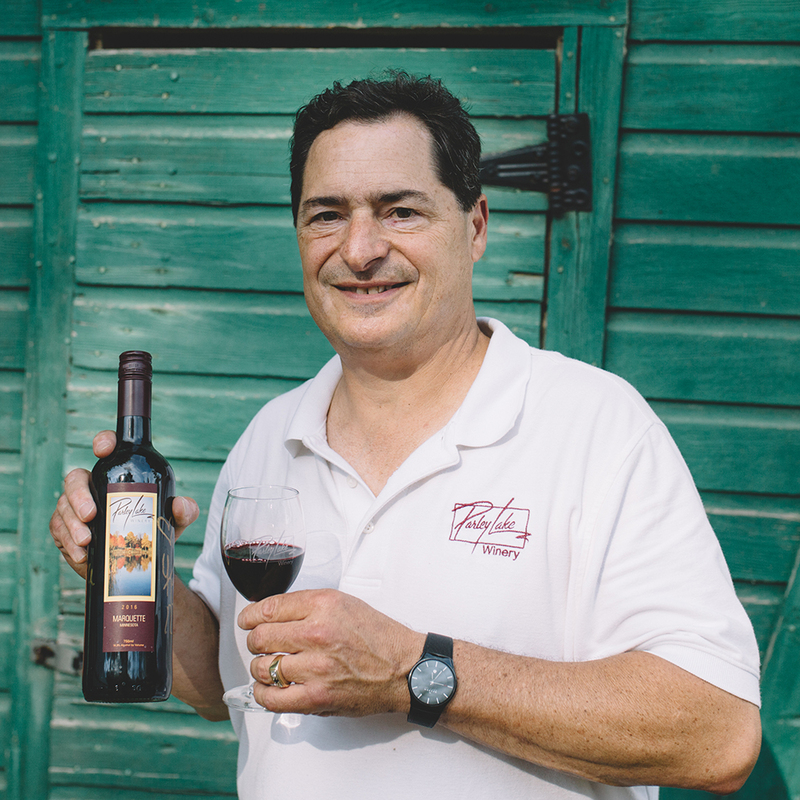 Defending the law is Steve Zeller, head winemaker at Parley Lake Winery in Waconia, Minnesota. 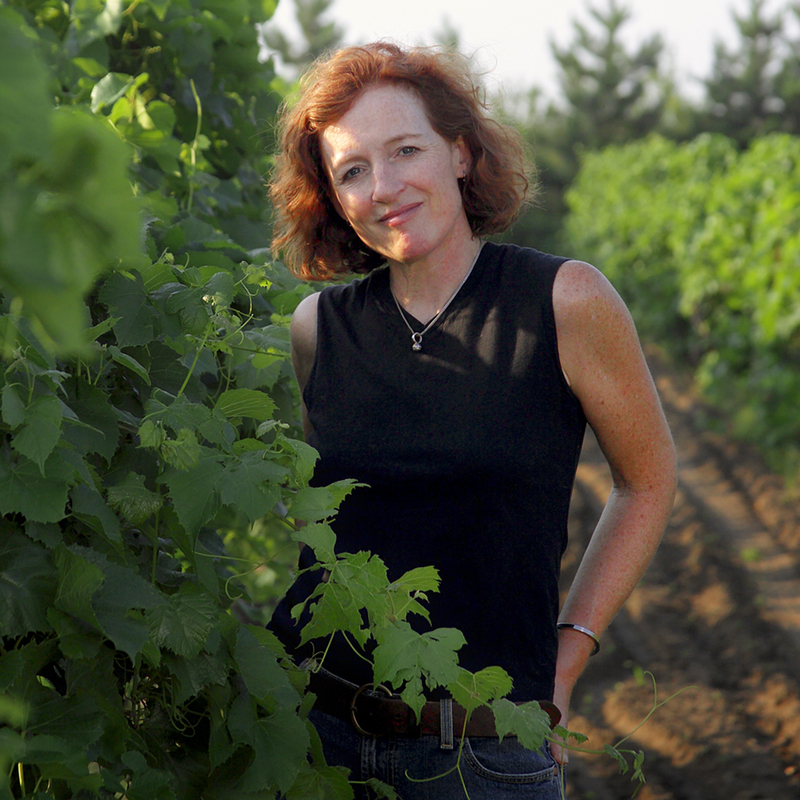 Opposing the law is Nan Bailly, co-owner and winemaker at Alexis Bailly Vineyard in Hastings, Minnesota. At Parley Lake Winery, the 51 percent requirement is core to who we are and a part of the fabric of everything we do. I was born and raised in Minnesota. I have two degrees from the University of Minnesota, the amazing organization that’s bred five world-class wine grape varieties that thrive in cold climates. I have had the opportunity to travel and work in more than 40 countries, and everywhere I travel I learn how lucky and proud we all should be to call ourselves Minnesotan. 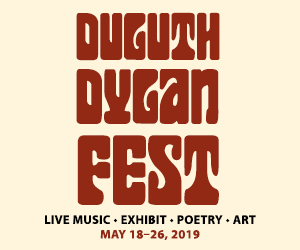 Highly educated, deeply connected to all that is local, and amazingly philanthropic. After planting University of Minnesota grapes in 2005, we established Parley Lake Winery as a Minnesota Farm Winery in 2008 because it stands for all we aspire to be as a company: to craft a product that is locally made from grapes developed, grown, and harvested in Minnesota. We strive to provide an authentic agritourism experience in our tasting room, and, above all, we attempt to provide transparency in all that we do. We recognize the requirements of providing at least 51 per- cent of the wine we make to be sourced from Minnesota-grown grapes. We know that along with this requirement comes a special privilege of being able to self-distribute or sell our wines directly to restaurants and wine shops. We also would be allowed to sell wines on- and off-sale on Sundays. This requirement—to provide most of our wines from local grapes—is not a heavy chain of burden. We have a choice and relative freedom in where we source our grapes. 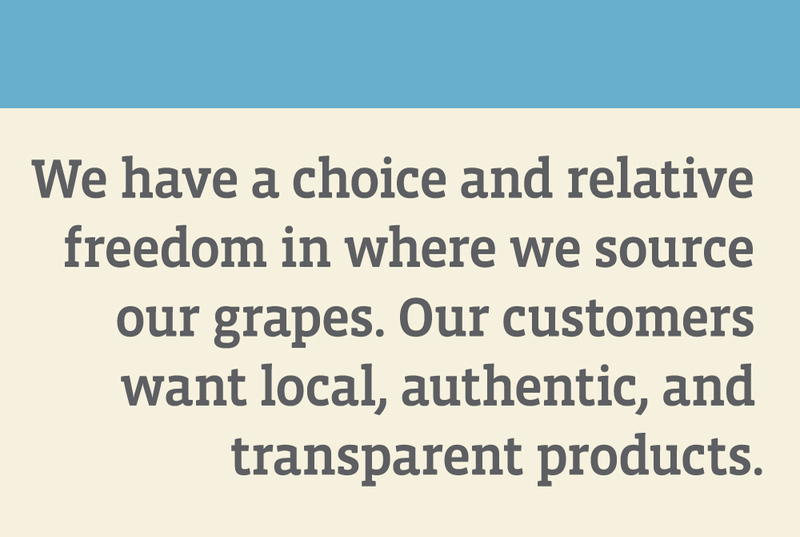 Our customers want local, authentic, and transparent products. Parley Lake Winery has more than 200 medals in national and inter- national competitions, including 55 gold medals. Virtually all have come from Minnesota-grown and produced wines. 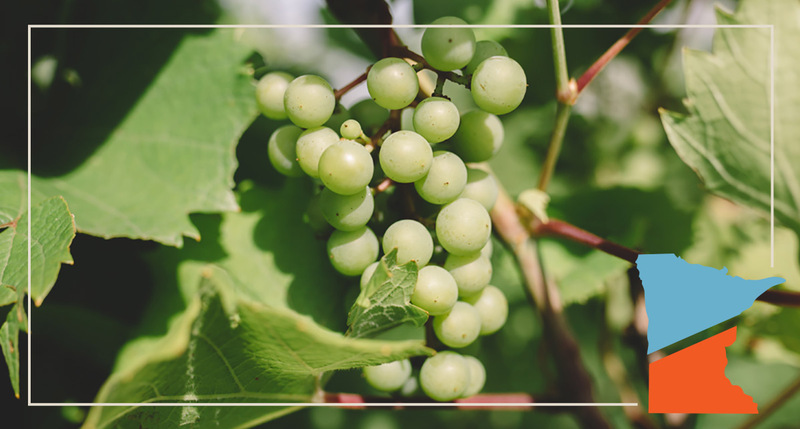 It is only natural that we choose to harvest more than 90 percent of our grapes from Minnesota vineyards each year. If I want to label my wines as Minnesota, such as Minnesota Marquette or Minnesota La Crescent, I am required by federal law to have 75 percent of the grapes in that specific wine sourced from Minnesota. (By the way, if you are in California or Oregon and you want to label your wine as California or Oregon, 100 percent of your grapes must come from those respective states.) I also have the freedom to label a specific wine with no Minnesota designation; I just need to have at least 51 percent of all the grapes I use to make it come from Minnesota. Now to the crux of the laissez faire, Libertarian, capitalist perspective: Why should the government be allowed to tell me what I must put in my wine? Some vintners would say it stifles their creativity and hurts their ability to make economically viable wine. We have many choices as winemakers and winery owners in Minnesota. 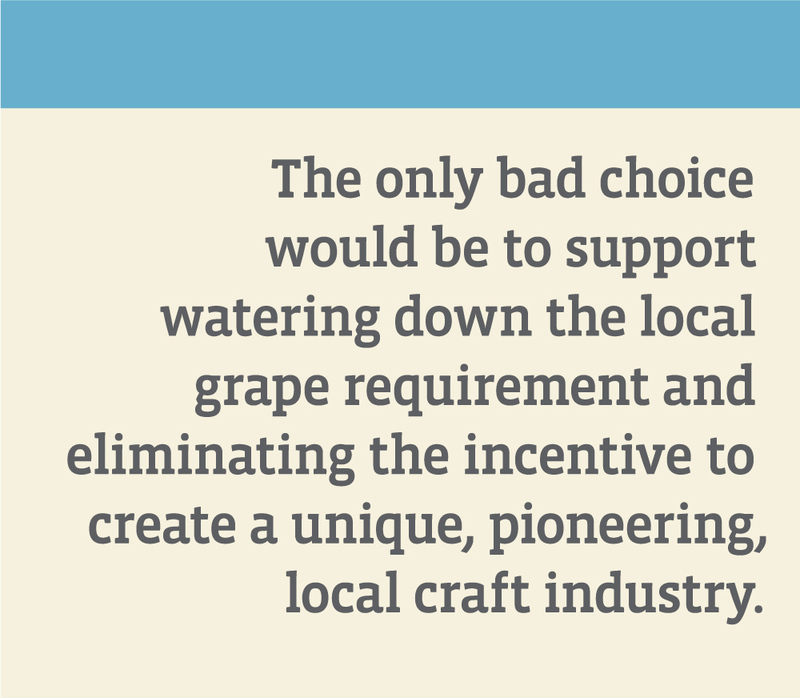 The only bad choice would be to support watering down the local grape requirement and eliminating the incen- tive to create a unique, pioneering, local craft industry. Our survival as an industry should not be predicated on lowering our costs by bringing in more “copycat” nondescript juice. It is to leverage this gift of great grapes from the U of M and craft truly amazing experiences in wine for our customers. In 1973 my father purchased and planted a vineyard, which began our 45-year history of making wines from Minnesota-grown grapes. No one knows the struggles of growing grapes in Minnesota better than I do. Minnesota wineries need a source of fruit they can rely on. Most years I lose a percentage of my grapes for winemaking. In 2018, I lost 80 percent of a normal crop. Purchasing grapes from elsewhere is the only way a winery in Minnesota can succeed. If I or any winery wants to sell our products directly to the public—as just about any small vintner must do to earn a living—51 percent of our grapes must be grown in Minnesota. That is not 51 percent of grapes grown on my own land, but 51 percent grown anywhere in the four corners of the state. This makes no sense, and that’s why I’m challenging it in court. 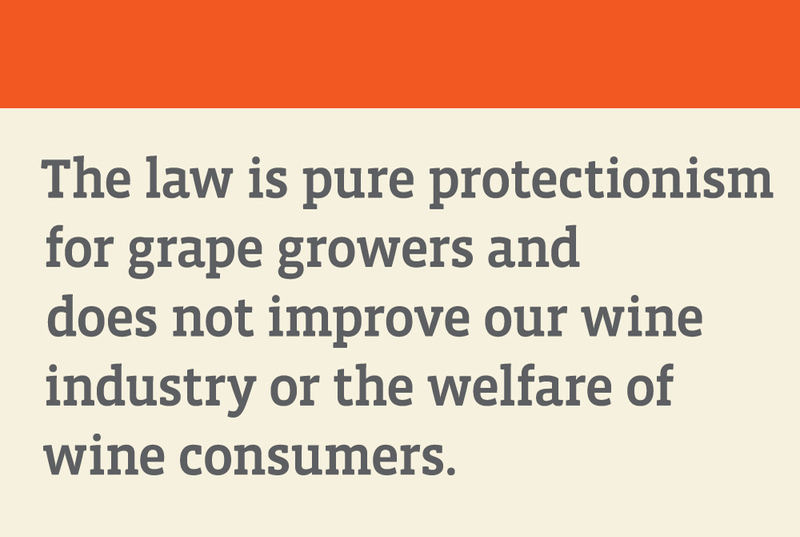 The law is pure protectionism for grape growers, and does not improve our wine industry or the welfare of wine consumers. Neither Iowa nor Wisconsin has a percentage rule for their wineries and both states have significantly more wineries than Minnesota. People go to wineries because they like to drink wine, and local wineries create and support agro-tourism. Consumers can decide for themselves what wines they want to buy. Federal labeling laws protect consumers from fraud. Wines produced from California fruit cannot be called Minnesota wine. times. But it is very possible that I could be denied a waiver, and that fact means my growth is limited, as I cannot plan on expanding. And if a waiver would never be denied, why have the law? Is not the very fact of the waiver proof of the law’s absurdity? Although the law would be unconstitutional in any state— as the Constitution guarantees free trade among the states— it makes even less sense in Minnesota than elsewhere. We have few choices when it comes to grape varieties that can survive a winter, and most of those varieties are notoriously high in acid. Adding chemicals to artificially reduce acidity is not a commercial standard for winemaking and it is not a style of wine I want to make. Imagine telling a painter he can only use a couple colors on his palette. My choices are limited and my freedom to make the kind of wine I want to make restricted. Look at the creation of Super Tuscan wines in Italy. Winemakers were unhappy with the state-mandated grapes they were forced to use so they fought the restrictive wine laws by bringing in new grape varieties to improve the quality of their wines. These are now some of the most famous wines made in the world. 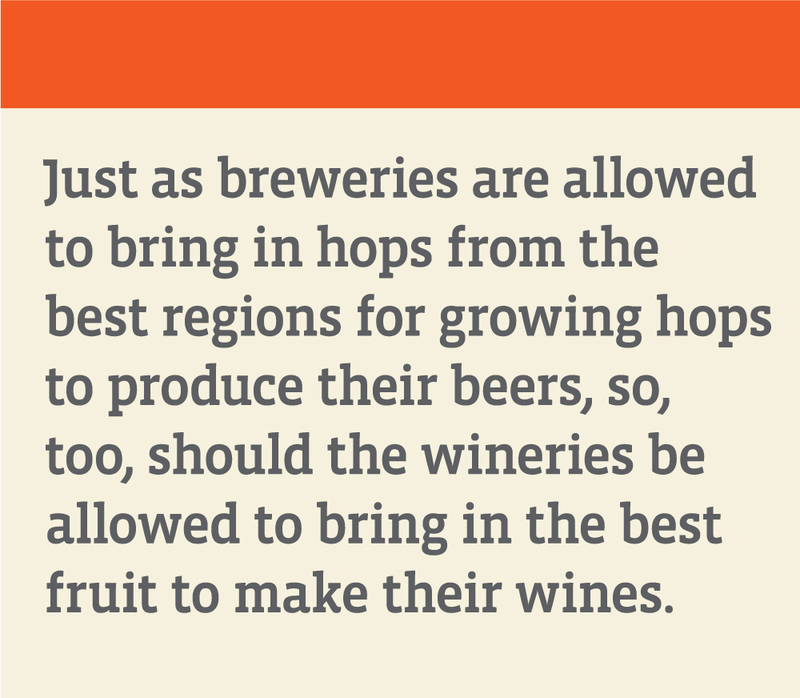 Just as breweries are allowed to bring in hops from the best regions for growing hops to produce their beers, so, too, should the wineries be allowed to bring in the best fruit to make their wines. Buying grapes from other growers in Minnesota when we need to supplement our crop is expensive, as the 51 percent mandate creates a false economy for the market. The price of Minnesota-grown grapes is often more than those from established wine-growing areas, including Napa Valley. To grow the industry, Minnesota wineries need to be able to produce the best wines they are capable of producing. They should be afforded the freedom to pursue this goal and not be constrained by laws that shackle the creativity of the winemakers. Only then will Minnesota’s wine industry truly flourish.